Udaipur: "Science is that which relies on Empirical evidence and can be proved"
Said the world renowned Space Scientist, Dr.Anil Bhardwaj, Director, Physical Research Laboratory, Ahmedabad, in reply to a question "what perspective of science and technology needs to be promoted at school level-science and technology as a collection of various facts and miracles or the scientific methods through which we can test the explanations we give?" Quoted Dr.AnilBhardwaj, Director, Physical Research Laboratory, referring to the witty advertisement of Amul published in 2014 as an apt remembrance of successful launching of India's Mars Orbiter Mission (MOM)-which includes Mars Exospheric Neutral Composition Analyser (MENCA) on which he worked extensively. He proudly recollected how India, became the first Asian nation to reach the Mars orbit and First Nation in the world to do so in its first attempt. This was possible only due to a dedicated team of professionals working day and night at the Indian Space Research Organisation (ISRO) and due to the supportive environment available for science and technological research and development in the country. Dr. Bhardwaj was delivering a lecture on "Indian Planetary Missions: Challenges and Opportunities" at a day long Science Outreach Program organised jointly by PRL, Ahmedabad, and VidyaBhawan Society, Udaipur, at the VB Auditorium today. He gave a background of ISRO and PRL and their work related to study of the composition, dynamics, formations, interrelations, history of planetary systems and processes. In simple terms, and with the help of documentary films, he shared the details of Mangalyaan-1: India's First Interplanetary Mission including, the objectives of the mission, the phases, the challenges faced in each phase for example, payloads, tracking the launch and the mission, spacecraft autonomy, handling power systems, testing of sub systems during launch, propulsion into the Mars orbit, handling the idling engine, etc. Similarly he discussed the launch and challenges related to Chandrayan-1. He shared details of Chandrayaan-2, India's second mission to the Moon which will be a totally indigenous mission comprising of an Orbiter, Lander and Rover as well as Aditya-L1 (Langrangian point) mission to study the Sun. 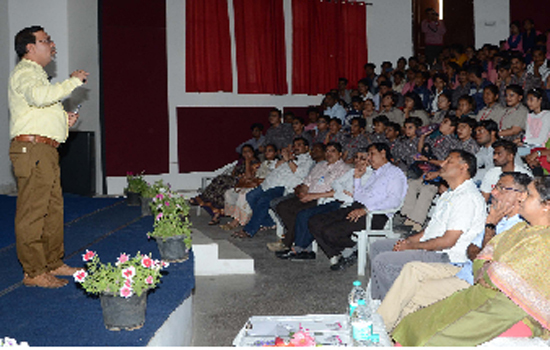 He motivated, and apprised the under graduate and post graduate students about the facilities and opportunities (scholarships/internships) available at PRL for research in fundamental science.In his welcome address, Shri Ajay Mehta, President, VidyaBhawan Society, traced the history of VB and its ethos and role in national reconstruction pre and post independence. He shared VB has always strived to create an openness in students by building and promoting qualities of scientific temperament, responsible citizenship, self reliance, critical thinking. Language was never a barrier for learning and its approach has been to promote equity and equality. He expressed hope that such programs would continue, and go a long way in inspiring students to become scientists and infuse new vigour to scientific research and development in the country. Dr.Suraj Jacob, CEO, VidyaBhawan, lauded Dr.Bhardwaj's abilities to communicate high level science in the spirit of adventure before the students and praised how, through 'effective science communication', he easily reduced the otherwise existing hierarchies between scientists/science professors/teachers and students. He stressed that science can be improved through two way communication with children. While the first half of the day comprised lecture, question-answer session, in the second half, movies on space science were screened by Dr.Ramit and Dr.Bhuvan of USO followed by an interesting round of question answers with the school and college students. An exhibition was set-up at the venue wherein, VB students and USO research scholars displayed charts and presented short videos related to the solar system. The program, which certainly created a buzz of curiosity among the students was coordinated by Dr.Anil Mehta, Principal, VidyaBhawan Polytechnic College and facilitated by a joint team of VB and USO representatives. It is hoped that this partnership will continue and benefit the society at large.